The design of Praktina cameras was developed by Siegfried Böhm in the factory of Kamera-Werkstätten, a German Company located in Niedersedlitz near Dresden. A prototype of Praktina was shown in September 1952 at the Trade Fair in Leipzig. One year later was shown the final version with the name Praktina FX. 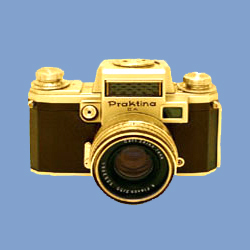 At the beginning of 1954 the Kamera-Werke started the marketing of the Praktina FX. In 1958 was released the Praktina IIA but in 1960 the Kamera-Werke took the decision to stop the production of these cameras owing to the expensive manufacturing costs. This camera is of great historical importance and represents a milestone in the development of the 35mm single-lens reflex cameras. The Praktina was the first 35mm single-lens reflex camera that offered the possibility of replacing lens, viewfinder, focusing screen, camera back and of mounting an electric motor. It was also the first SLR in the world to place inside the camera body the mechanism to close automatically the diaphragm to the pre-selected aperture. 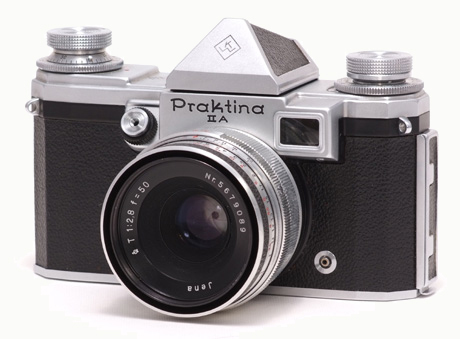 With its lenses and accessories the Praktina is the first example of a professional 35mm SLR camera system. It has held for some years an outstanding position into specialized applications due to its original accessories as the remote control of electric motor, the 17m magazine back, the special viewfinders and various scientific devices. Kamera-Werke has released to the market all the production of Praktina cameras with the marks "FX" or "IIA", but an analysis has shown the existence of five generations of "FX" and of two generations of "IIA". For this reason the production of Praktina has been analysed taking into account seven models, identified with the codes FX-DS, FX-M, FX-SA1, FX-SA2, FX-SA3, IIA-A and IIA-DA. About the numbers of cameras produced, in the Richard Hummel book is specified a total of 101,856 units, 77,008 of series FX and 24,848 of series IIA. I don't agree with these numbers. My currently estimation is c. 88,000 units, c. 58,000 of series FX and c. 30,000 of series IIA. Every effort will be made to improve the accuracy of these figures. About the real dates of production of the different models, there are very few information. In many cases, the presentation of a model is much in advance of its appearance on the market. The same can be said of the accessories. This edition has been expanded with new pages that document KW accessories, third party accessories, lenses from various German and Japanese manufacturers, the Praktina N and the Pentacon Super, KW brochures, KW working instructions and the bibliography on the Praktina. The history of KW has been expanded and some corrections were made. The pages of the prototypes and of the Praktina with different names have been updated. The information to identify each model and version has been improved. Finally the classification of the models has been changed for better analysis of the production of Praktina cameras. Any information or correction is welcome.